Chocolate caramel thumbprints are in my top ten list of cookies that I could eat for the rest of my life. A chocolate dough coated with pecans and then filled with caramel after baking is really all you could ask for in a cookie! 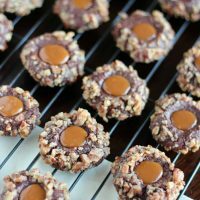 Oh these chocolate caramel thumbprint cookies are something! The good kind of something– the kind you can’t stop at eating just one. The only way I saved myself from gaining ten pounds when I made these cookies was that I made them for a cookie exchange. The pressure of knowing that I needed 60 cookies to share (and not one less!) forced me to limit how many of these beauties I ate. 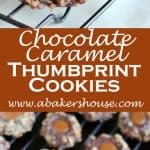 What ingredients are in this thumbprint cookie? 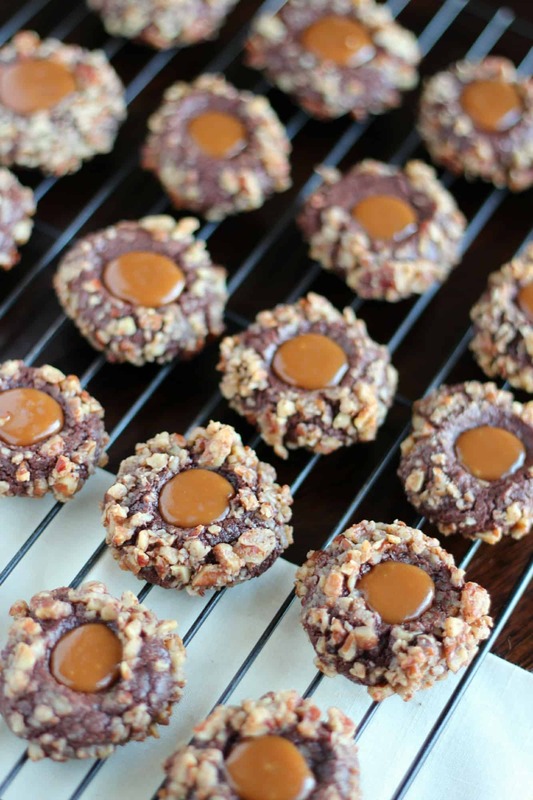 Did I mention that there is chocolate AND caramel AND pecans all wrapped up in this one cookie recipe? Is this an America’s Test Kitchen recipe? Yes, America’s Test Kitchen knows how to tempt with cookie recipes and this is no exception. I found this cookie in their Holiday Special issue a few years ago. The dough is made and refrigerated, then balls of dough are dipped in egg whites and coated with pecans. The caramel is the treat added after baking. This is a multi-step process but well worth the finished product. Do I need to toast the nuts first? Many times when you are baking with nuts, it helps to bring out the flavor by toasting them first. In this recipe there is no need to do so. All of the pecans are on the outside of the cookie. None are mixed throughout the dough. All the pecans will be lightly toasted as the cookies bake. Can I substitute of skip the nuts? Of course, play with the ingredients to suit your tastes and dietary needs. If you want to use almonds, pistachios or walnuts, be my guest. Or skipping the outer coating of nuts all together is perfectly fine too. It’s your cookie! You can't go wrong with chocolate, caramel and pecans. Go ahead, treat yourself! In a medium bowl combine flour, cocoa powder and salt. Whisk gently then set aside. You may use an electric hand-held mixer or a stand mixer. I prefer the stand mixer in this case. beat the sugar and butter until light and creamy. Add in the egg yolk and mix until thoroughly combined. Continue by adding the milk and vanilla and mix again until the ingredients are well incorporated. Add the dry ingredients and mix on low just until the flour mixture is no longer seen in the dough. Try not to over mix (i.e. don't leave the stand mixer going on its own -- you only need to mix for 5-10 seconds at this stage). Form the dough into a flattened ball, wrap tightly in plastic wrap and refrigerate for 1-2 hours. If you need to refrigerate longer or even overnight that is fine. Simply let the dough warm slightly before rolling it out by setting it on the countertop for 30 minutes. In a small bowl whisk the egg whites until frothy. Make inch to inch and a half sized balls of dough. Dip the balls into the egg whites then roll in the chopped pecans. Place on a parchment lined baking sheet, leaving room between the balls so the cookies can spread. Press down with your thumb in the middle of the dough ball or use a small measuring spoon sprayed in baking spray to make your indentations. Meanwhile combine the caramels and the heavy cream in a microwave safe bowl. Microwave in 30 second intervals, stirring in between, until the mixture is smooth and melted completely. As soon as the cookies come out of the oven you'll need to re-press your indentation with the back of a spoon (it will be too hot for your fingers!). Spoon a bit of the caramel on to each cookie. If you have leftover caramel you could drizzle it back and forth over each cookie. You can never have too much caramel!! These cookies are my favorite recipe for cookie exchange parties! Do you have a favorite cookie for a cookie exchange party? I’d love to hear about it! Leave me a comment below. Please make these for a cookie exchange that I am attending!!!! 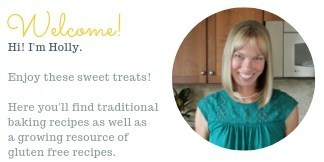 Oh my gosh what I wouldn’t give to be part of your cookie exchange. These do look amazing! These looks amazing, Holly. Such a great contrast of textures. I am sure I wouldn’t share with anyone if I make these.